The Future of Fashion Retail: Will Your Wardrobe Look Like This in 2027? 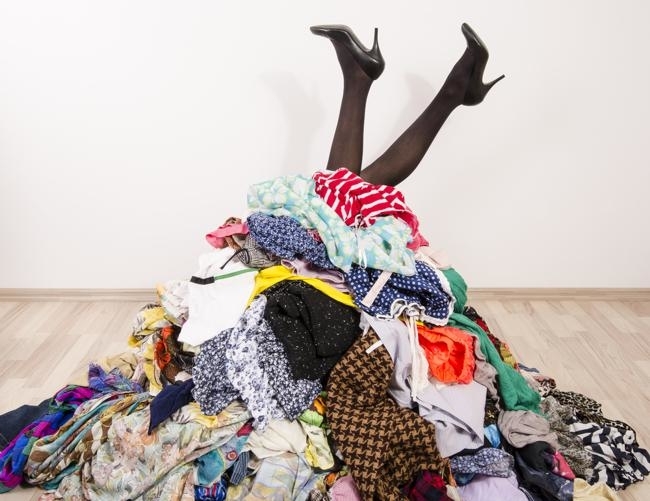 It was previously claimed the average woman does not use 60% of her wardrobe. That's £2,400 worth of clothes that hang on a rail, limp and untouched. This is no longer the case. The retail sector is transforming - and so too is a shopper's mindset. So, what does the future of fashion retail look like? And will your wardrobe look like this in 2027? According to ThredUP's 2018 Resale Report, new apparel experiences and emerging brands have given the modern shopper choice, showcasing the future of fashion retail. A new way to shop that includes resale (the sale of an item previously bought), clothing subscription services, direct-to-consumer and off-price outlets; not to mention value chains and fast fashion. This extensive selection has influenced fashion retail consumers to make considered choices, not fritter their cash away on clothes they will never wear. Bearing this in mind, OnBuy has discovered what the wardrobe of the future is predicted to look like in the year 2027 - utilising ThredUP's report as source material. OnBuy found savvy shoppers will not be afraid to treasure hunt for quality, with Off-Price (think TK Maxx and outlets like Bicester Village) expected to fill 18% of our future wardrobe. Comparably, consumers will not shy away from higher value retail when it comes to investment pieces and staples, as Mid-Priced Speciality (the likes of Oliver Bonas, Reiss, Coast) will make up 14% of our closet space. "...it's exciting to consider what the wardrobe of the future will hold! It presents an exciting opportunity for consumers..."
Resale (eBay) and Direct-to-Consumer (ASOS) are predicted to represent 11% apiece by 2027. Whereas Fast Fashion (Topshop, H&M, Zara etc. ), Value Chains (supermarket clothing ranges are a fine example) and Department Stores such as John Lewis, will each hold 10% of our wardrobe space over the next decade. Garments will also be brought to us by new innovations such as Amazon fashion and beauty (4%) and Subscription and Rental services like Girl Meets Dress or Wear the Walk (2%), which continue to grow in popularity, as shoppers adapt to the changing world of retail. 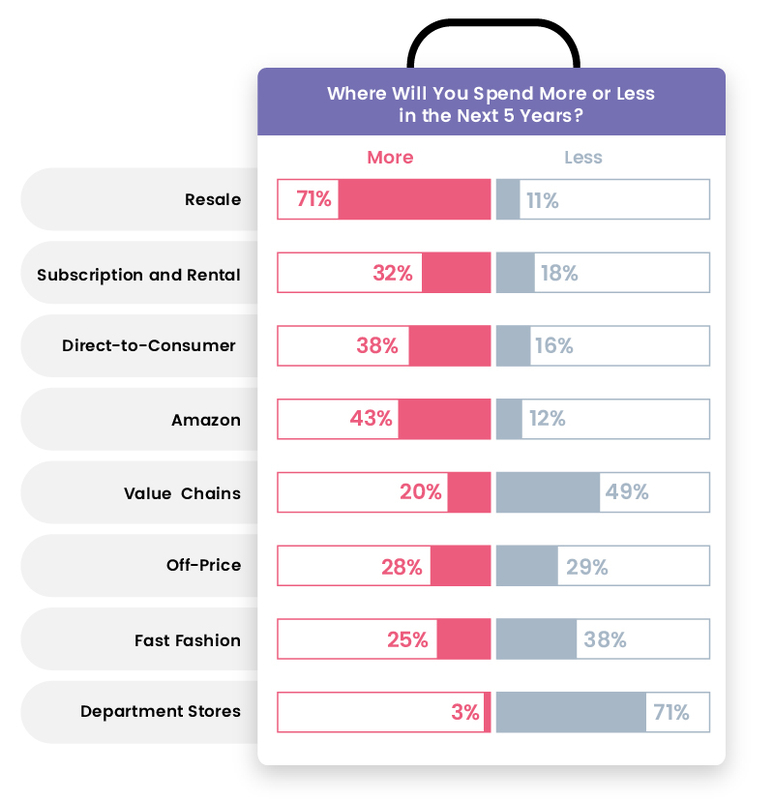 OnBuy also spent time surveying where consumers will spend more, or less, in the next 5 five years. Interestingly, large increases in consumer spend will be seen in the Resale sector (71%) followed by Amazon sales (43%) and Direct-to-Consumer lines like ASOS, with an increase of 38% over the next 5 years. 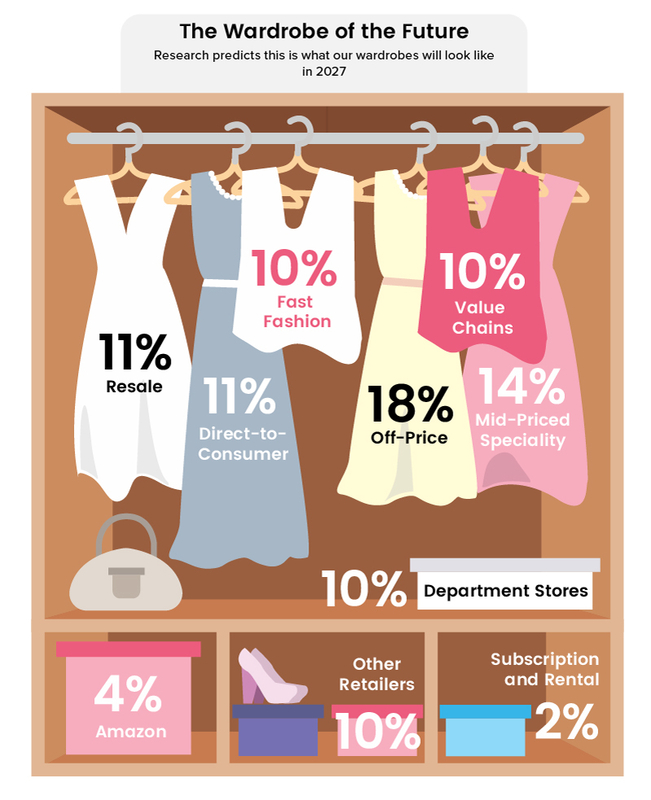 Through crunching these numbers, it's evident consumers will spend more time shopping online for women's clothing and will take control of their own sales using the resale market. The decline in consumer spend (over the next 5 years) in Department Stores (71%), Value Chains (49%) and Fast Fashion stores (38%) further highlights this. "It's so important to stress that retail is not dying, despite what is reported daily in the news. It is changing rapidly, there is no doubt about that. But I believe it is taking its natural course. Moreover, it's exciting to consider what the wardrobe of the future will hold! It presents an exciting opportunity for consumers to trial new apparel experiences to find what suits them. Plus, it allows a variety of brands to be discovered, making retail abundant not limited."